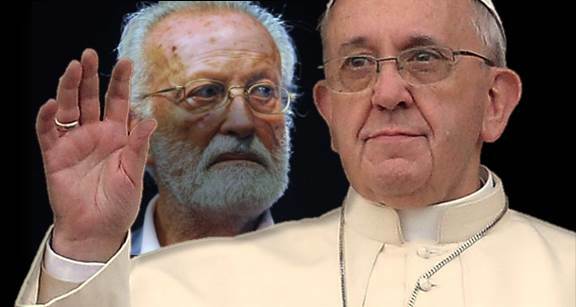 What must a poor Catholic think, when connecting to Internet on Holy Thursday morning he finds that the Pope has told an old journalist friend that hell doesn’t exist and that the souls who don’t repent simply disappear? A Pope who denies two truths of the Faith: Hell and the immortality of the soul. It cannot be, it has never happened in the history of the Church. And right at the beginning of the Paschal Triduum, when we relive the Sacrifice of Our Lord, Who came to save us from sin. Diabolical timing. If Hell doesn’t exist neither does salvation. It matters little that it is not a magisterial text and that it’s the ‘usual’ article by the founder of the Repubblica, Eugenio Scalfari, who transcribed the sense of a conversation with Pope Francis at Santa Marta. The statement is of unprecedented magnitude and devastating consequences. Mothers, in general, flee away from the presence of their sons when they see them suffer, and cannot render them any assistance; content enough would they be themselves to endure their sons’ sufferings; and, therefore, when they see them suffering without the power of succoring them, they have not the strength to endure so great a pain, and consequently flee away, and go to a distance. Not so Mary. She sees her Son in torments; she see that the pains are taking His life away; but she flees not, nor moves to a distance. On the contrary, she draws near to the cross whereon her Son is dying. O sorrowing Mary! Disdain me not for a companion to assist at the death of thy Jesus and mine. She stood near the cross. The cross, then, is the bed whereon Jesus leaves His life; a bed of suffering, where this afflicted Mother is watching Jesus, all wounded as He is with scourges and with thorns. Mary observes how this her poor Son, suspended from those three iron nails, finds neither a position nor repose. She would wish to give Him some relief; she would wish, at least, since He has to die, to have Him die in her arms. But nothing of all this is allowed her. Ah, cross! She says, give me back my Son! Thou art a malefactor’s gibbet; whereas my Son is innocent. But grieve not thyself, O Mother. It is the will of the Eternal Father that the cross should not give Jesus back to thee until after He has died and breathed His last. 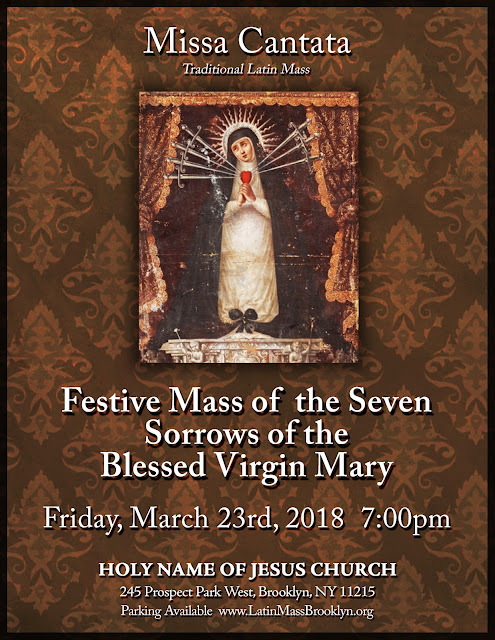 O Queen of Sorrows! Obtain for me sorrow for my sins. There stood by the cross His Mother. Meditate, my soul, upon Mary, as she stands at the foot of the cross watching her Son. Her Son! But, O God, what a Son! A Son Who was, at one and the same time, her Son and her God! A son Who had from all eternity chosen her to be His Mother, and had given her a preference in His love before all mankind and all the angels! A Son so beautiful, so holy, and so lovely; A Son Who had been ever obedient unto her; a Son Who was her one and only love, being as He was both her Son and God. And this Mother had to see such a Son die of pain before her very eyes! 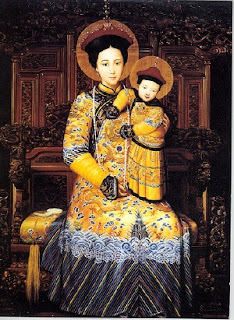 O Mary, O Mother, most afflicted of all mothers! I compassionate thy heart, more especially when thou didst behold Jesus surrender Himself up upon the cross, open His mouth , and expire; and, for love of this thy Son, now dead for my salvation, do thou recommend unto Him my soul. For years now the Turkish President, Recep Tayyip Erdoğan has been officially celebrating May 29th 1453 which saw the conquest of Constantinople by Mohamed II, along with the date of August 26th 1071, when the Seljuks of Alp Arslān defeated the Byzantine army at Manzikert and founded the first Turkish State in Anatolia. No, my God, there is none that has loved me more than Thou. But what return shall I ever be able to make to a God Who has been willing to die for me? What love from a creature will ever be able to recompense the love of his Creator, Who died to gain his love? Ah, my Redeemer, O love of my soul! How shall I ever be able to forget Thee? How shall I ever be able to think that my sins have reduced Thee so low, and not always bewail the wrongs that I have done to Thy goodness? How shall I ever be able to see Thee dead of pain on this cross for love of me, and not love Thee to the uttermost of my power? O my dear Redeemer! Well do I recognize in these Thy wounds, and in Thy lacerated body, as it were through so many lattices, the tender affection which Thou does retain for me. Since, then, in order to pardon me, Thou has not pardoned Thyself, oh, look upon me now with the same love wherewith Thou didst one day look upon me from the cross, whilst Thou wert dying for me. Look upon me and enlighten me, and draw my whole heart to Thyself, that so, from this day forth, I may love none else but Thee. Let me not ever be unmindful of Thy death. Thou didst promise that, when raised up upon the cross, Thou wouldst draw all our hearts to Thee. Behold this heart of mine, which, made tender by Thy death, and enamored of Thee, desires to offer no further resistance to Thy calls. Oh, do Thou draw it to Thyself, and make it all Thine own! Thou hast died for me, and I desire to die for Thee; and if I continue to live, I will live for Thee alone. O pains of Jesus, O ignominies of Jesus, O death of Jesus, O love of Jesus! Fix yourselves within my heart, and let the remembrance of you abide there always, to be continually smiting me, and inflaming me with love. I love Thee, O infinite goodness; I love Thee, O infinite love. Thou art and shalt ever be, my one and only love. O Mary, Mother of love, do thou obtain me love. Behold how the loving Saviour is now drawing nigh unto death. Behold, O my soul, those beautiful eyes growing dim, that face become all pallid, that heart all but ceasing to beat, and that sacred body now disposing itself to the final surrender of its life. After Jesus had received the vinegar, He said: It is consummated. He then passed over in review before His eyes all the sufferings that He had undergone during His life, in the shape of poverty, contempt and pain; and then offering them all up to the Eternal Father, He turned to Him and said, It is finished. My Father, behold by the sacrifice of my death, the work of the world’s redemption, which Thou hast laid upon me, is now completed. And it seems as though, turning Himself again to us, He repeated, It is finished; as if He would have said, O men, O men, love me, for I have done all; there is nothing more that I can do in order to gain your love. He is dead! O God! Who is it that is dead? 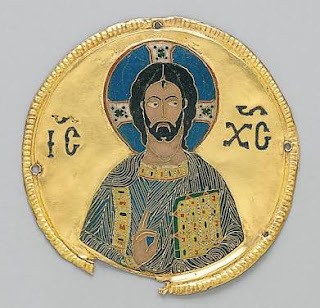 The author of life, the only-begotten Son of God, the Lord of the world, - He is dead. O death! Thou wert the amazement of heaven and of all nature. O infinite love! A God to sacrifice His blood and His life! And for whom? For His ungrateful creatures; dying in an ocean of sufferings and shame, in order to pay the penalty due to their sins. Ah infinite goodness! O infinite love! O my Jesus! Thou art, then, dead, on account of the love which Thou has borne me! Oh, let me never again live, even for a single moment, without loving Thee! I love Thee, my chief and only good; I love Thee, My Jesus, - dead for me! O my sorrowing Mother Mary, do thou help a servant of thine, who desires to love Jesus. While Jesus upon the cross is being outraged by that barbarous populace, what is it that He is doing? He is praying for them, and saying, O My Father, forgive them; for they know not what they do. O Eternal Father, hearken to this Thy Beloved Son, Who, in dying, prays Thee to forgive me too, who have outraged Thee so much. Then Jesus, turning to the good thief, who prays Him to have mercy upon him, replies: Today shalt thou be with Me in paradise. Oh, how true is that which the Lord spake by the mouth of Ezekiel, that when a sinner repents of his faults, He, as it were, blots out from His memory, all the offences of which he has been guilty: But if the wicked do penance…I will not remember all his iniquities. O would that it were true, my Jesus, that I had never offended Thee! But, since the evil is done, remember no more, I pray Thee, the displeasures that I have given Thee; and, by that bitter death which Thou hast suffered for me, take me to Thy Kingdom after my death; and, while I live, let Thy love reign within my soul. Jesus, in His agony upon the cross, with every part of His body full of torture, and deluged with affliction in His soul, seeks for someone to console Him. He looks toward Mary; but that sorrowing Mother only adds by her grief to His affliction. He casts His eyes around Him and there is no one that gives Him comfort. He asks His Father for consolation; but the Father, beholding Him covered with all the sins of men, even He too abandons Him; and then it was that Jesus cried out with a loud voice: Jesus cried out with a loud voice, saying My God, My God, why hast Thou forsaken me? My God, My God, why has Thou also abandoned Me? This abandonment by the Eternal Father caused the death of Jesus Christ to be more bitter than any that has ever fallen the lot of either penitent or martyr; for it was a death of perfect desolation, and bereft of every kind of relief. O my Jesus! How is it that I have been able to live so long a time in forgetfulness of Thee? I return Thee thanks that Thou has not been unmindful of me. Oh, I pray Thee ever to keep me in mind of the bitter death which Thou has embraced for love of me, that so I may never be unmindful of the love which Thou hast borne me! Jesus then, knowing that His sacrifice was now completed, said that He was thirsty: He said, I thirst. And the executioners then reached up to His mouth a sponge, filled with vinegar and gall. But, Lord, how is it that Thou does make no complaint of those many pains which are taking away Thy life, but complainst only of thirst? Ah, I understand Thee, my Jesus; Thy thirst is a thirst of love; because Thou lovest us, Thou dost desire to be beloved by us. Oh, help me to drive away from my heart all affection which are not for Thee; make me to love none other but Thee, and to have no other desire save that of doing Thy will. Recently the attention of the media in Italy has been focused on the fortieth anniversary of Aldo Moro’s kidnapping. On March 16th 1978, in an ambush on Via Fani in Rome, the Christian Democrat politician was kidnapped and his bodyguards murdered by the Red Brigade. On May 9th, after a captivity of 55 days, his body was found riddled with bullets in the boot of a car in Via Caetani. 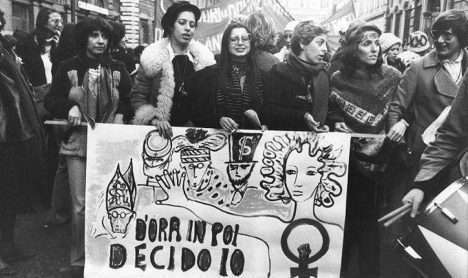 No-one has yet to recall though, that, during that same springtime of 1978, the law n.194 on abortion was debated and approved by the Italian Parliament and that since then, it has been the cause of six million victims in our country. As some readers may know, the Pontifical Commission "Ecclesia Dei" has given new permission to a handful of traditional priestly societies to offer Holy Week liturgies this month as they existed before the massive Pius XII / Archbishop Bugnini reforms of 1955. 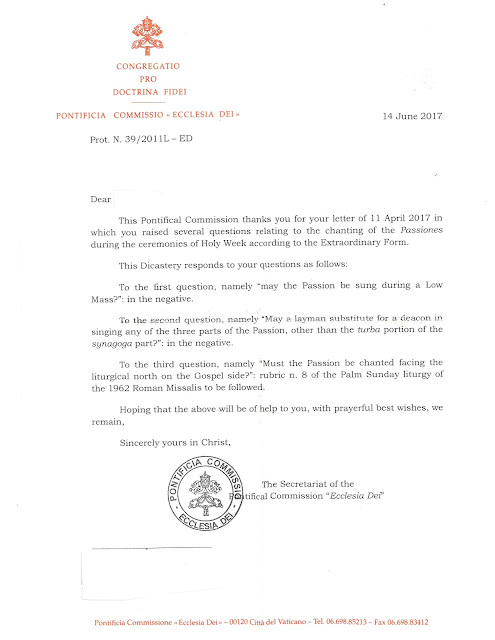 The permission, confirmed by Rorate via several sources at the priestly societies, is for a limited time on an experimental basis. In other words, if the Masses are offered well, with proper education and preparation beforehand, then perhaps this indult could lead to something larger in the future. Traditional (and conservative) Catholic blogs were asked to hold off on reporting this until after Palm Sunday. 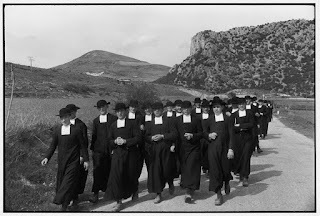 (You may have noticed, however, several posts on the pre-1955 Holy Week in general.) 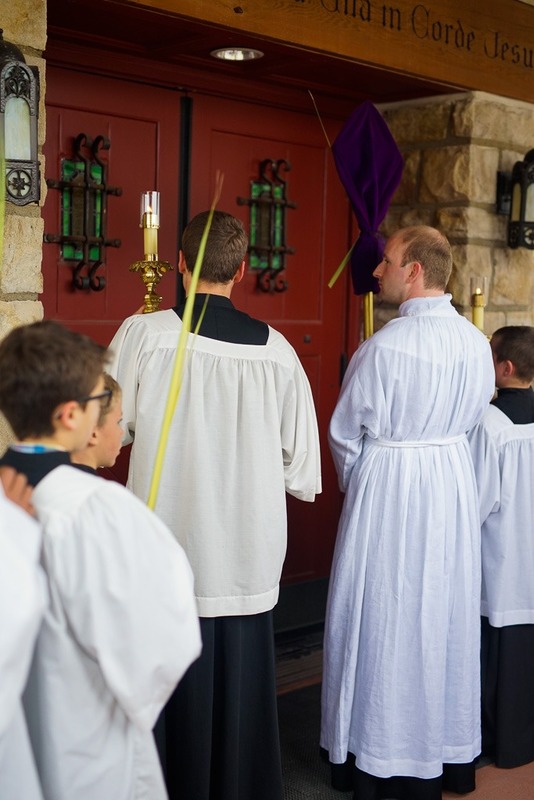 The main goal, it seems, from the priests organizing this week's liturgies is to do them well -- and not necessarily cause too much of a global media fuss. 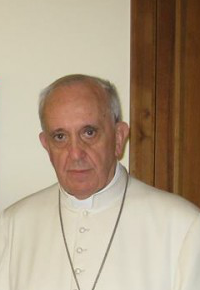 Pastoral decisions were also made, and compromises such as using Pope Benedict's reformed Prayer for the Jews were decided upon, to avoid liberal advocacy group-driven complaints that caused a media stir in 2008 following Summorum Pontificum. Jesus on the cross! Behold the proof of the love of a God; behold the final manifestation of Himself, which the Word Incarnate makes upon this earth, - a manifestation of suffering indeed, but, still more, a manifestation of love. 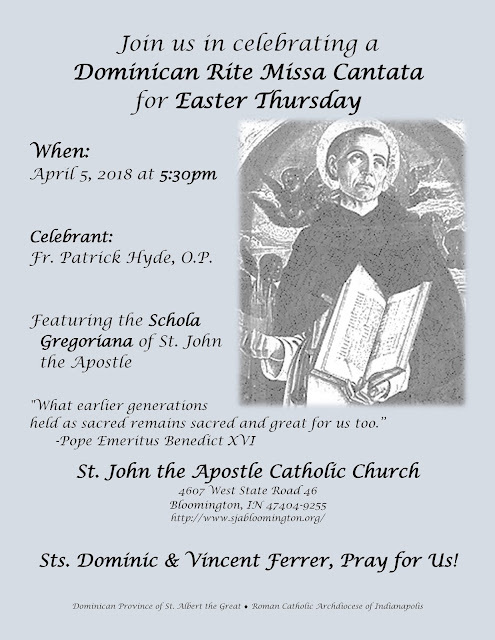 St. Francis of Paola, as he was one day mediating upon the Divine Love in the person of Jesus Crucified, rapt in ecstasy, exclaimed aloud three times, in these words, “O God – Love! O God- Love! O God - Love!” wishing hereby to signify that we shall never be able to comprehend how great has been the Divine love towards us, in willing to die for love of us. O my beloved Jesus! If I behold Thy body upon this cross, nothing do I see but wounds and blood; and, then, if I turn my attention to Thy heart, I find it to be all afflicted and in sorrow. Upon this cross I see it written that Thou art a king; but what tokens of majesty dost Thou retain? I see not any royal throne save this tree of infamy; no other purple do I behold save Thy wounded and bloody flesh; no other crown save this band of thorns that tortures Thee. Ah, how it all declares Thee to be king of love! Yes, for this cross, these nails, this crown and these wounds are, all of them, tokens of love. Jesus, from the cross, asks us not so much for our compassion as for our love; and, if even He does ask our compassion, He asks it solely in order that the compassion may move us to love Him. As being infinite goodness, He already merits all our love; but when placed upon the cross, it seems as if He sought for us to love Him, at least out of compassion. Ah, my Jesus, and who is there that will not love Thee, while confessing Thee to be the God that Thou art, and contemplating Thee upon the cross? Oh, what arrows of fire dost Thou not dart at souls from that throne of love! 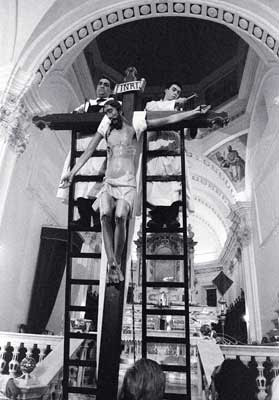 Oh, how many hearts hast Thou not drawn to Thyself from that cross of Thine! O wounds of my Jesus! O beautiful furnaces of love! Admit me, too, amongst yourselves to burn, not indeed with that fire of hell which I have deserved, but with holy flames of love for that God Who has been willing to die for me, consumed by torments. O my dear Redeemer! Receive back a sinner, who, sorrowing for having offended Thee, is now earnestly longing to love Thee. I love Thee, I love Thee, O infinite goodness, O infinite love. O Mary, Mother of beautiful love! Obtain for me a greater measure of love, to consume me for that God Who has died consumed for love of me. No sooner had the Redeemer arrived, all suffering and wearied out, at Calvary, than they strip Him of His clothes, - that now stick to His wounded flesh, - and then cast Him down upon the cross. Jesus stretches forth His holy hands, and at the same time offers His life to the Eternal Father, and prays of Him to accept it for the salvation of mankind. In the nest place, the executioners savagely lay hold of the nails and hammers, and, nailing His hands and His feet, they fasten Him to the cross. O ye Sacred Hands, which by a mere touch have so often healed the sick, wherefore are they now nailing you upon the cross? O Holy Feet, which have encountered so much fatigue in your search after us lost sheep, wherefore do they now transfix you with so much pain? When a nerve is wounded in the human body, so great is the suffering, that it occasions convulsions and fits of fainting: what, then, must not the suffering of Jesus have been, in having nails driven through His hands and feet, parts which are most full of nerves and muscles! O my sweet Saviour! So much did the desire of seeing me saved and of gaining my love cost Thee! And I have so often ungratefully despised Thy love for nothing; but now I prize it above every good. The Cross is now raised up together with the Crucified, and they let it fall down with a shock into the hole that had been made for it in the rock. It is then made firm by stones and pieces of wood; and Jesus remains hanging upon it, to leave His life thereon. The afflicted Saviour, now about to die upon that bed of pain, and finding Himself in such desolation and misery, seeks for someone to console Him, but finds none. Alas, you barbarians, He is now about to die, according as you desire; at least torment Him not with your reviling. See how much thy dying Redeemer is suffering upon that gibbet! Each member suffers its own pain, and the one cannot come to the help of the other. Alas, how does He experience in every moment the pains of death! Well may it be said that in those three hours during which Jesus was suffering His agony upon the cross, He suffered as many deaths as were the moments that He remained there. He find not there even the slightest relief or repose, whether He lean His weight upon His hands or upon His feet; wheresoever He leans the pain is increased, His most holy body hanging suspended, as it does, from His very wounds themselves. Go, my soul, and tenderly draw nigh to theat cross, and kiss that altar, whereon thy Lord is dying a victim of love for thee. Place thyself beneath His feet, and let that Divine Blood trickle down upon thee. Yes, my dear Jesus, let this Blood wash me from all my sins, and set me all on fire with love towards Thee, my God, Who hast been willing to die for love of me. Do thou, O suffering Mother, who dost stand at the foot of the cross, pray to Jesus for me. The sentence upon Our Saviour having been published, they straightway seize hold of Him in their fury: they strip Him anew of that purple rag, and put His own raiment upon Him, to lead Him away to be crucified on Calvary, - the place appropriated for the execution of criminals: They took off the cloak from Him, and put on Him His own garments, and led Him away to crucify Him.” (Matt. xxvii 31.) They then lay hold of two rough beams, and quickly make them into a cross, and order Him to carry it on His shoulders to the place of His punishment. What cruelty, to lay upon the criminal the gibbet on which he has to die! But this is Thy lot, O my Jesus, because Thou has taken my sins upon Thyself. Jesus refuse not the cross; with love He embraces it, as being the altar whereon is destined to be completed the sacrifice of His life for the salvation of men: And bearing His own Cross, He went forth to that place which is called Calvary. The condemned criminals now come forth from Pilate’s residence, and in the midst of them there goes also our condemned Lord. O that sight which filled both heaven and earth with amazement! To see the Son of God going to die for the sake of those very men from whose hands He is receiving His death! Behold the prophecy fulfilled: And I was as a meek lamb, that is carried to be a victim. The appearance that Jesus made on this journey was so pitiable that the Jewish women, on beholding Him, followed Him in tears: They bewailed and lamented Him. O my Redeemer! By the merits of this sorrowful journey of Thine, give me strength to bear my cross with patience. I accept of all the sufferings and contempts which Thou dost destine for me to undergo. Thou hast rendered them lovely and sweet by embracing them for love of us: give me strength to endure them with calmness. Behold, my soul, now that thy condemned Saviour is passing, behold how He moves along, dripping with blood that keeps flowing from His still fresh wounds, crowned with thorns, and laden with the cross. Alas, how at every motion is the pain of all His wounds renewed! The Cross, from the first moment, begins its torture, pressing heavily upon His wounded shoulders, and cruelly acting like a hammer upon the thorns of the crown. O God! At every step, how great are the sufferings! Let us meditate upon the sentiments of love wherewith Jesus, in this journey, is drawing nigh to Calvary, where death stands awaiting Him. Ah, my Jesus, Thou art going to die for us. In time past I have turned my back upon Thee, I would that I could die of grief on this account! But for the future I have not the heart to leave Thee, O my Redeemer, my God, my love, my all! O Mary, my Mother, do thou obtain for me strength to bear my cross in peace. "It was felt necessary to revise and enrich the formulae of the Roman Missal. 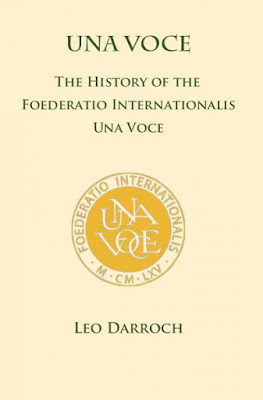 The first stage of such a reform was the work of Our Predecessor Pius XII with the reform of the Easter Vigil and the rites of Holy Week (1), which constituted the first step in the adaptation of the Roman Missal to the contemporary way of thinking"
In the course of recent years, the publication of numerous studies concerning the history of the theological and liturgical debate of the 1950's has cast new light on the formation and the intentions (which were not always openly declared at the time) of those who were the actual composers of certain texts. See radioimmaculata.org : explained below. This is the gut-wrenching cry we hear at the Office of Tenebrae during the Paschal Triduum at the end of the Lamentations of the Prophet Jeremiah. Jerusalem - the Holy City of God; where the faithful of the Lord are supposed to dwell are called to turn back and face the Lord once again. The Lamentations of Jeremiah are rather disquieting as one hears the miseries of a people who have abandoned the Lord, of Jerusalem whose destruction is close at hand. 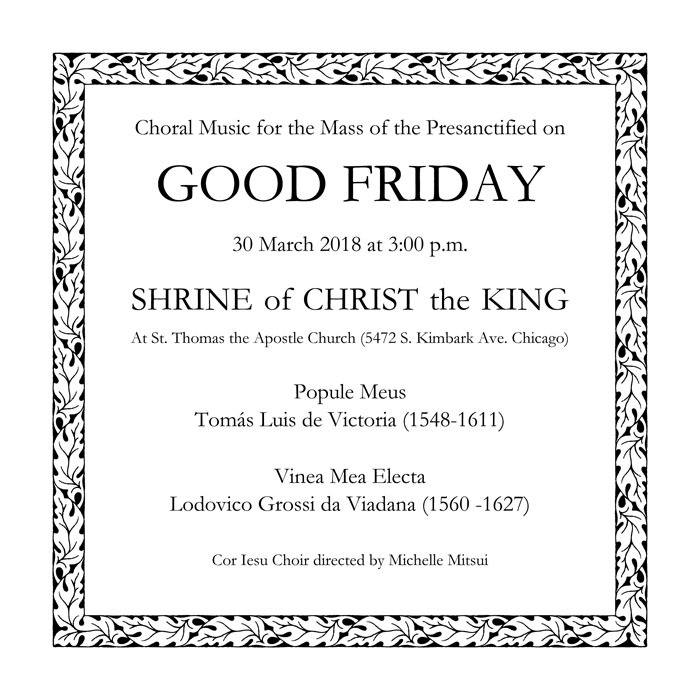 The Choir Director of the ICKSP Shrine of Christ the King in Chicago has asked us to share the following information. 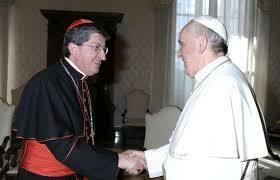 Five years into the Bergoglio pontificate, Rorate is (finally!) far from alone in our reporting and analysis of Pope Francis. 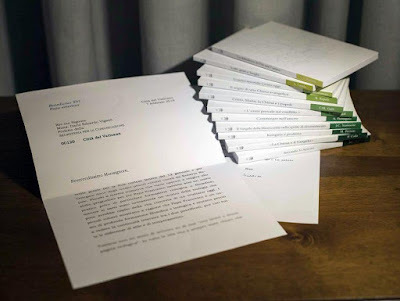 Several books exposing the behavior and methods used by Jorge Bergoglio have been, or are in the process of being, published. Ross Douthat, the lone conservative columnist at the New York Times, has one such book in the works, which will be released next week. Mr. Douthat had a column in the Sunday New York Times (largely an excerpt from his forthcoming book) exposing the myth that Francis would grow the Church (Mass attendance has been down under this pontificate), and examining how calling for a "truce" on hot-button issues has been part of a stealth agenda of incremental liberalization. Socci: Do the hierarchies in the Church still have the Catholic Faith? The parish priest of Cisterna in Latina, Don Livio Fabiani caused a bit of sensation with his words at the funeral of the two children killed by their father. Yet perhaps – for Catholics – the homily of Cardinal Giuseppe Betori, Archbishop of Florence, at the funeral of the Fiorentina’s Captain, Davide Astori, who died two Sundays ago of a heart attack, ought to be a source of more amazement. These two tragedies have made us face sudden death, the eruption of evil and the suffering of the innocents. We are all dumbstruck. The words “waste and void” repeated by Thomas S. Eliot in his poem describe our hearts in these situations. through the streets of the City of London to the church's front door. This Holy Week in London, a rare opportunity to experience one of the oldest services in the Catholic Church along with a feast of sacred music rarely sung in its proper context. “It is once again a great pleasure to be making the musical preparations for the Latin Mass Society’s flagship celebration of the Sacred Triduum in the Archdiocese of Westminster. “Music by Franco-Flemish renaissance Orlande de Lassus (1532–94) will enhance the Office of Tenebrae, which will be particularly special with not only the haunting four-part Responseries but also the great five-part Lamentations of Jeremiah. These glorious masterpieces, date from the 1580s. Sermon for Passion Sunday: "Before Abraham was, I AM"
Where did he go? Jesus hid himself. Hide and go seek? That children’s game that has its roots in the mysterious state of hiddenness and the triumph of “I found you!” It is in that statement of triumph that the mystery has been solved. I know where you are . The unknown has been conquered, the gnarly mystery of not knowing where you are has been solved. The mystery is evaporated. The truth: “before Abraham was, I am”. In Summa Theologiae III, q. 85, a. 5, St. Thomas Aquinas writes that there are six principles of penance. These principles of penance, according to Aquinas, are the “acts whereby in penance we co-operate with God operating” (III, q. 85, a. 5, corpus). Reflecting on these principles during the season of Lent can be helpful for us as we prepare for the Holy Triduum. How have we been using our time during this Lent? Have we been truly sorry for our sins, or are we wasting our time idly pursuing worldly ends and goals? How diligently have we been purging ourselves of earthly attachments, bad habits, and sinful behaviors? Have we been striving to become closer to God in prayer? These are the questions to ask ourselves as we read and reflect upon the six principles offered by Aquinas. First, a note on penance in general: in I-II, q. 113, a. 5, Thomas writes that sadness is a sign of love. Penance is sadness over our sins; we repent over the wrong that we have committed, and we resolve not to commit the same sins again. Thus, when we are sad over our sins, we should ultimately be sad because of offending God who is Love, who loved us so much that He suffered and died for us on the Cross. The Vatican admitted Thursday that it altered a photo sent to the media of a letter from retired Pope Benedict XVI about Pope Francis. The manipulation changed the meaning of the image in a way that violated photojournalist industry standards. Guest Op-Ed - Musings from the Chinese Underground: "The Vatican is forcing us to obey perverted bishops!" I recently read Msgr. Anthony Figueiredo's interview in the National Catholic Register. I initially wanted to ignore his statements, like I did with other Chinese "experts". However, these past few months, the Church in China received "seismic tremors" too strong to ignore. Considering the gravity of the matter, I thought I would share my humble musings with Rorate Caeli readers. Surprise surprise! We have another Chinese "expert" talking about the Church in China. Mind you, an "expert" who doesn't speak Chinese, doesn't understand Chinese culture, and whose experience of China is visiting government-approved places. (What I like to call "tourist traps".) How absurd is that? It's like an Argentinian saying he's an expert on the United States because he once visited Jacksonville, Florida! Why don't we have REAL Chinese people and experts at the diplomacy table? Why did they get rid of 2 high-ranking prelates (Cardinal Zen and Archbishop Hon), and replace them with "prelate-tourists" who praise Communism? Why did an 86-year-old retired Cardinal need to fly to Rome in order to hand-deliver a letter to the Holy Father? Mind you, it's a 14-hour flight! These professional diplomats, who AREN'T Chinese and who know little about China, are making grave decisions affecting the lives of millions of Catholics. And I for one am afraid... afraid of their foolishness and naïveté! They wish to help us regularize our situations and aid in our evangelization efforts, yet they're taking away our moral authority. They're forcing us to follow and obey hypocritical bishops who have mistresses and fathered children, who pervert the teachings of Jesus Christ, and who kowtow to the Golden Calf. Who may chant the Passion? Six years ago Rorate posted on who is allowed to sing the Passion during Holy Week. The answer, we thought, was pretty clear, but apparently not everyone agreed. 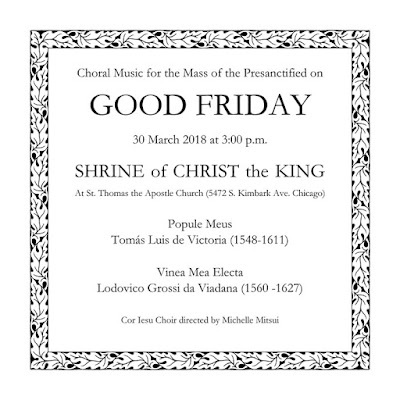 Some traditional Latin Masses employed laymen to chant entire parts of the Passion, as performed via the novus ordo. To summarize, the privilege to chant the Passion begins at the diaconate level for all three parts of the Passion (except for the turba portion of the synagoga). We are very pleased to first announce the publication of a new English/Italian website: www.pre1955holyweek.com. This new site is a comprehensive introductory resource for those interested in the celebration of the pre-1955 Holy Week liturgies. The website features free downloadable booklets, in the vernacular and Latin, with the complete ceremonies for Palm Sunday, Holy Thursday, Good Friday and the Easter Vigil. These include running commentaries and historical notes throughout by Blessed Adolph Schuster. There are also Tenebrae booklets and an introductory explanation of Holy Week by Adrian Fortescue from the “Holy Week Book”. 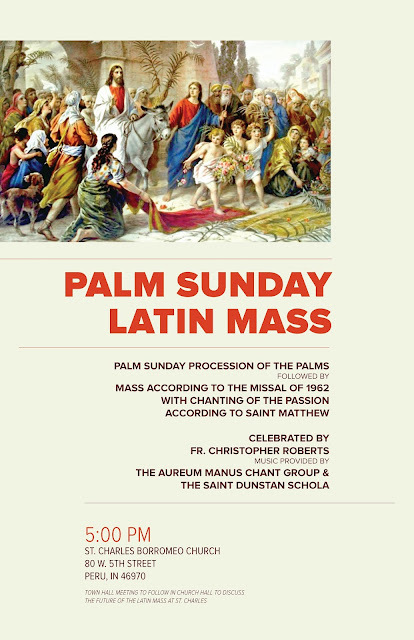 Interested clergy will find everything they need to get started, including a full Cantus Passionis download, audio aid with accompanied notation for the Passiontide Gospel tone particular only to this traditional Holy Week, and the Fortescue ceremonial. There are also links to some articles about the 1955 reform of Holy Week. 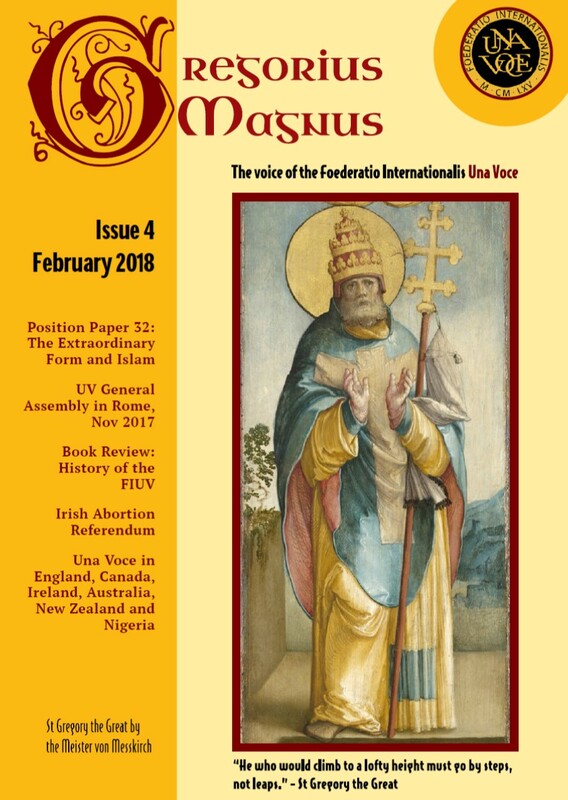 I have pleasure in presenting the new edition of the quarterly magazine of the Foederatio Internationalis Una Voce (Una Voce International), Gregorius Magnus: the 4th edition. 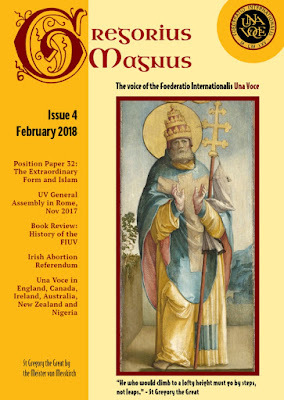 This is a re-launch for Gregorius Magnus, which was published briefly in 2012. We hope that it will provide a truly international space for news and discussions important to the Traditional Movement, as well as an attractive platform for the FIUV. 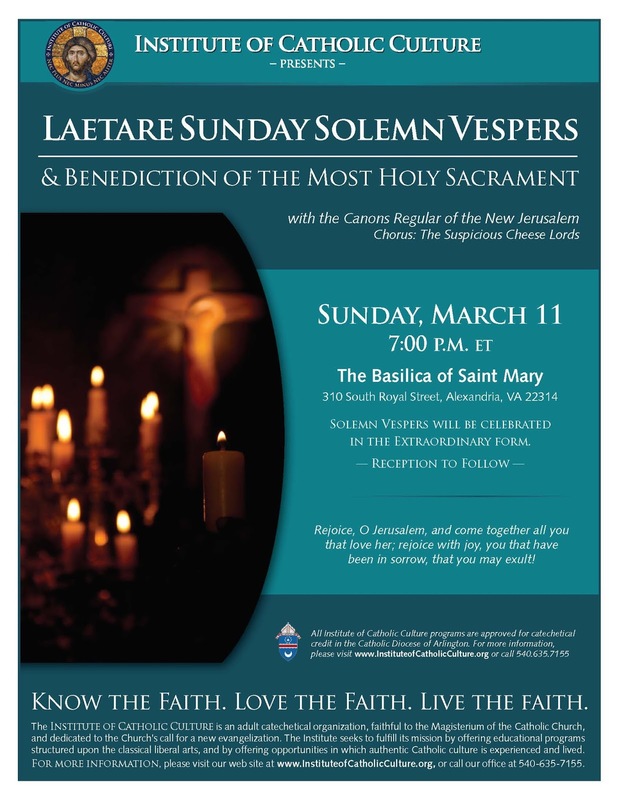 The Institute of Catholic Culture will be hosting the Canons Regular of the New Jerusalem at the Basilica of St. Mary in Alexandria, Va. this Sunday for Laetare Sunday Vespers. Vespers will be celebrated in the Extraordinary Form. 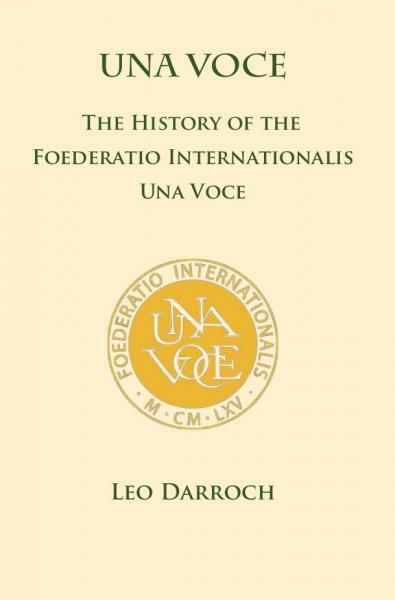 Leo Darroch has produced a substantial and fascinating volume on the FIUV, commonly known as Una Voce International, from its beginnings up to the end of the presidency of the late Michael Davies. Davies’ predecessor, Eric de Savanthem, was President for 30 years, from the early days of the organisation, so the book revolves around these two remarkable men. Because of the nature of the material, the book is episodic in character. Some of these episodes are very revealing about the state of the Church at the time they took place, so I will devote this review to three of them. Note: The following is an article in epistolary form. I cannot be myself here in the seminary. I am always pretending to be someone else. I feel like I am playing a game with the rector and the other priests here, putting on a façade in order to please them, or so I do not get into ‘trouble’. This exhausts me especially spiritually but also physically. I came to seminary, as you know, because for me I cannot conceive of anything else I want to do except being a priest for the rest of my life. And also as you know, at the very center of that desire is my love for the Traditional Mass. 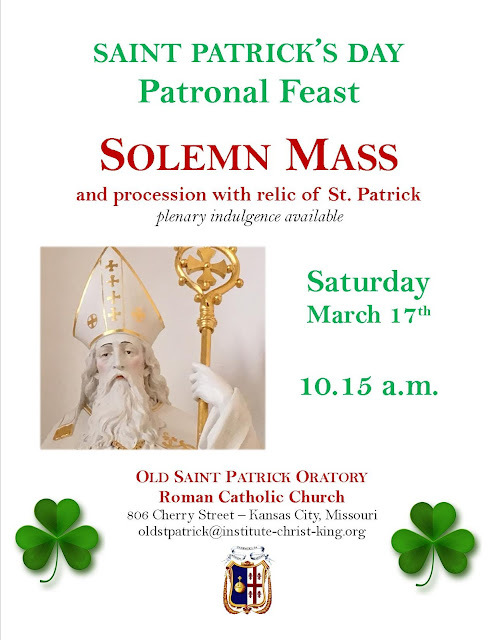 It was in your parish I discovered this treasure and it was serving that Mass for two years that deepened my understanding of the priesthood and what the Mass is all about. It is that love that I cannot show here. I have to suppress my love for the Traditional Mass and never let it show, for the faculty would see that in a negative way and that would affect my future in the diocese and may even prevent me from being ordained. 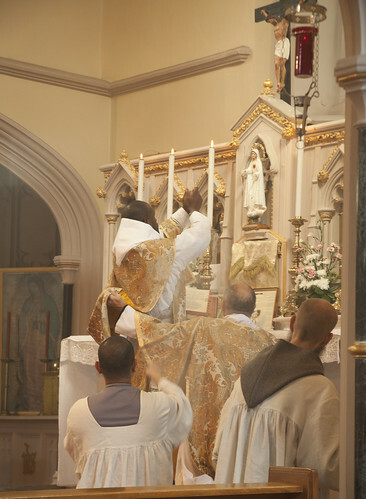 The other guys here who have the same love for the Traditional Mass have the common attitude to go with the current flow, keep your heard down, smile, never let them know what you are thinking until you are ordained. Then it is safe to come out of the liturgical closet so to speak. Even writing that last sentence dismays me that I should say such a thing. So I ask myself: Do I want to spend three more years not being honest about who I am and what drives me? Will not this have a bad effect on me personally and if I am ordained will not this way of living, this self-denial in a deep sense, will this not continue and make my priesthood a sham? Readers may be interested in this short video that explains the traditional Office of Tenebrae and why it is so powerful a way of entering into the Passion of the Lord.